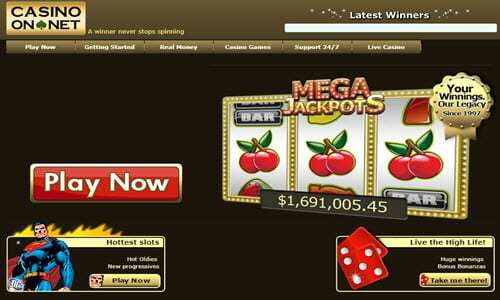 Casino-on-Net is the online casino wing of the extremely popular 888.com group. Launched in 1997 it is believed to be the first virtual casino and the site states that over 25 million players have walked through the virtual doors to play. The site is filled with high quality games in a variety of styles and the promotions and bonuses are among the best available online today. The casino is offered in many languages and should be on any player’s list of must-try casinos. With age comes experience and Casino-on-Net’s overall look, feel and gameplay show that the site has learned a lot in its over 10 years of existence. Casino-on-Net offers no download and free download versions of its games. This is great for players who may be at a friend’s house and want to play, or happen to run Mac or Linux software. The variety of games is, of course, among the tops in the industry and features just about any game you can imagine. Whether you like classics like Roulette, Blackjack, Baccarat, Video Poker and a long list of progressive games or simple but fun slots and variations of the classics, you won’t be disappointed. Casino-On-Net’s current welcome bonus stands at 100% up to $300. Twenty-Five percent of this bonus is deposited straight into your account with no minimums to meet, which is a great benefit to this casino. In addition to the initial bonus, players can receive a 10% guaranteed bonus for up to $100 for 12 months during monthly happy hour events. This equals $1,200 in bonuses over your first year. Over time, players can gain entrance to the 888 VIP club. Players in the club earn additional benefits not offered to everyone. Comp points at Casino-on-Net are given for every $10 wagers as well, so over time players can earn additional betting money. 888 online casino uses many methods to assure players are gambling in a safe and fair environment. Casino-on-Net uses the MD5 Random Number Generator (RNG) to assure that the games are fair and all results are truly random. Players have access to a log where they can see the results of all games, including amounts wagered, results and more. The site also uses outside auditor iTech Labs to assure the results are legitimate. As part of the 888.com group, Casino-on-Net is licensed and regulated by the Government of Gibraltar under the relevant laws of the Gaming Ordinance of Gibraltar. This license is in effect for the purposes of operating and offering Internet gambling services including casino. Casino-on-Net also makes sure all transactions are secure and does not include any spyware or additional software in its downloads.